During a late-night television appearance on Monday, Apple co-founder Steve Wozniak expressed his support for Apple in the company's ongoing fight with the FBI, saying the bureau "picked a lame case." 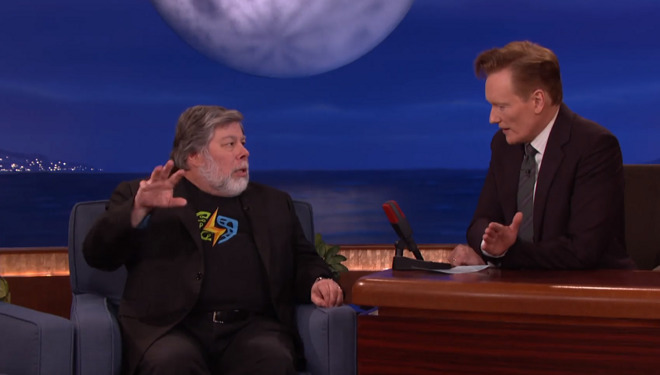 "I side with Apple on this one," Woz told Conan O'Brien during the show. He explained his stance by noting that he helped found the Electronic Frontier Foundation, and said that the FBI "picked the lamest case you ever could." "The two phones owned by the people that aren't even convicted terrorists, didn't even have one link to a terrorist organization, Verizon turned over all the phone records, all the SMS messages," Woz said. "So they want to take this other phone, that the two didn't destroy, that was a work phone, it's so lame and worthless to expect something's on it." Woz ended that portion of the interview by citing the fear of international precedent —that is, by acquiescing to a U.S. government demand, Apple would be giving carte blanche to other governments to make similar requests. "What if China says, 'we want you to give us a backdoor so we can get into any phone, even your government officials?'"